Critical Success Factors for successful transformation. Examine your planned approach against each of the four quadrants. Critically evaluate the sequence with which you are advancing your programme. Ensure that you are building a foundation firm enough to deliver a lasting step change in performance. Exalt Management Consulting’s experience includes all activities required for successful transformation. Exalt Management Consulting is keen to partner with you to help you deliver a successful transformation of great value. 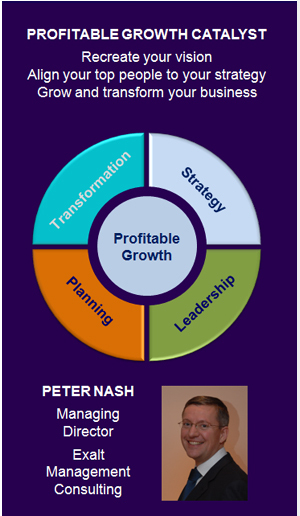 Our expertise in “Strategy” + “Leadership” + “Planning” + “Operating Model Change” will enable you to focus on delivering value and success for your company and shareholders.